Sashimi is a staple in our home. We never tire of it as the type of seafood we use for sashimi changes throughout the year. 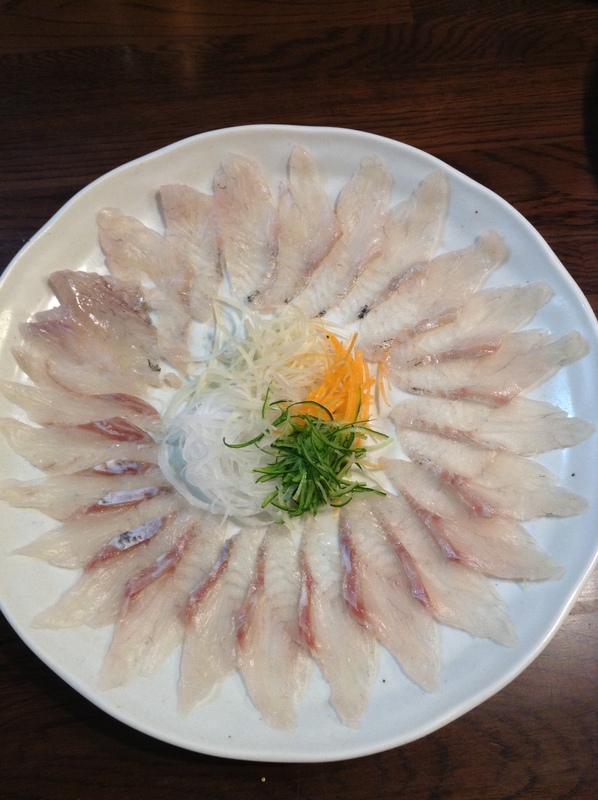 Suzuki, Japanese sea bass, is a firm-fleshed fish so it is cut in thin, usuzukuri slices. If it were cut thick, as we do with tuna, it would be too hard to chew through and unpleasant. In the middle here are julienned carrots, cucumbers, ginger, and daikon. Wrapping the sashimi around the vegetables is a nice contrast in textures. 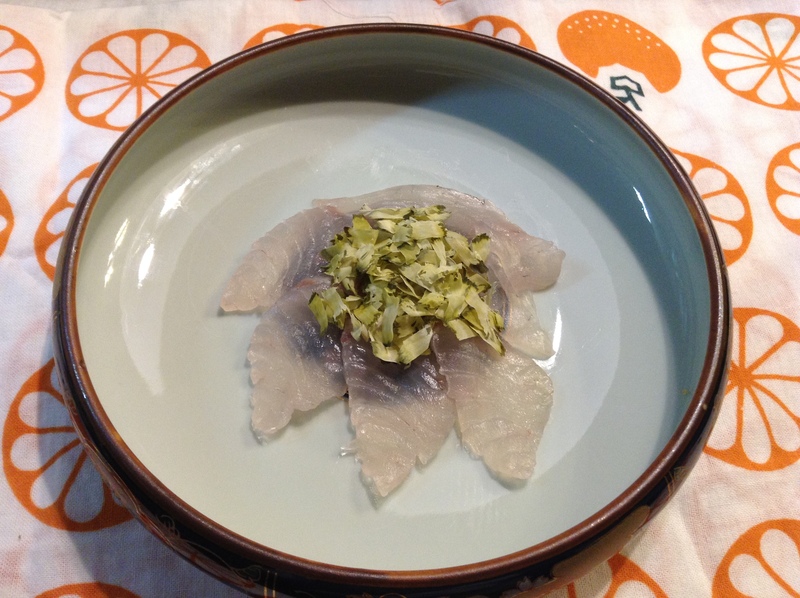 The classic seasoning for sashimi is wasabi and soy sauce, but that can become routine, so we change-up the seasonings. The green shavings here are from kombu (Laminaria japonica, Japanese kelp). Kombu is rich in natural umami. Most of the time we use kombu for making dashi, the essential stock for many Japanese dishes. Kombu dashi is good on its own as a vegetarian stock. In our home we usually steep the kombu with katsuobushi, smoked skipjack tuna (or bonito) flakes. The kombu shavings here are simply sprinkled over sashimi. Not only umami but it also gives the flavor of the ocean to the dish. It can also be used over tofu, rice, noodles, and even Japanese-style pasta. The name of the product is Hana-kezuri Kombu. Hana-kezuri is the name for the flower-like shavings, that is often seen with katsuobushi flakes. 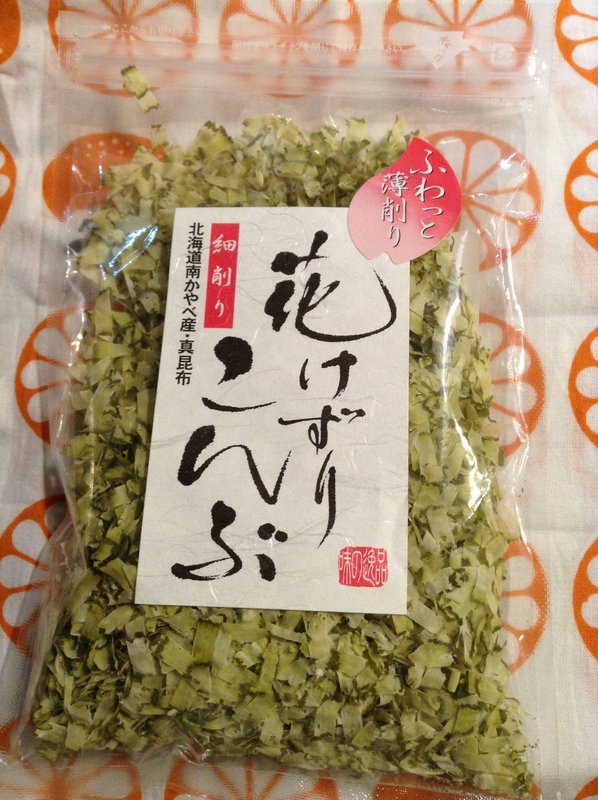 Hana-kezuri Kombu is made by Towa Shokuhin in Iwate prefecture. This was purchased at the Nomono shop at Ueno Station.